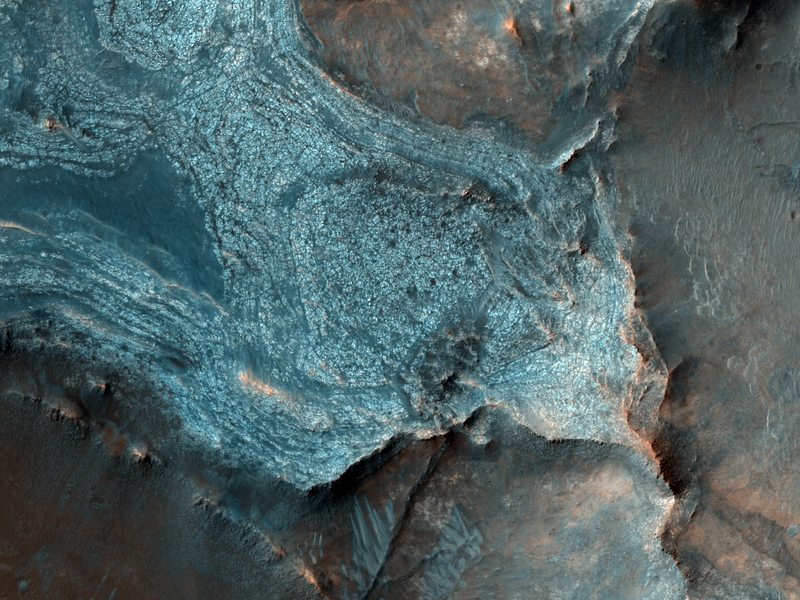 This HiRISE image shows a new impact site within a crevice in Fortuna Fossae, east of the Tharsis Quadrangle. There are five distinct craters that were created nearly simultaneously, indicating the meteorite broke up into 5 different pieces just prior to hitting the surface. 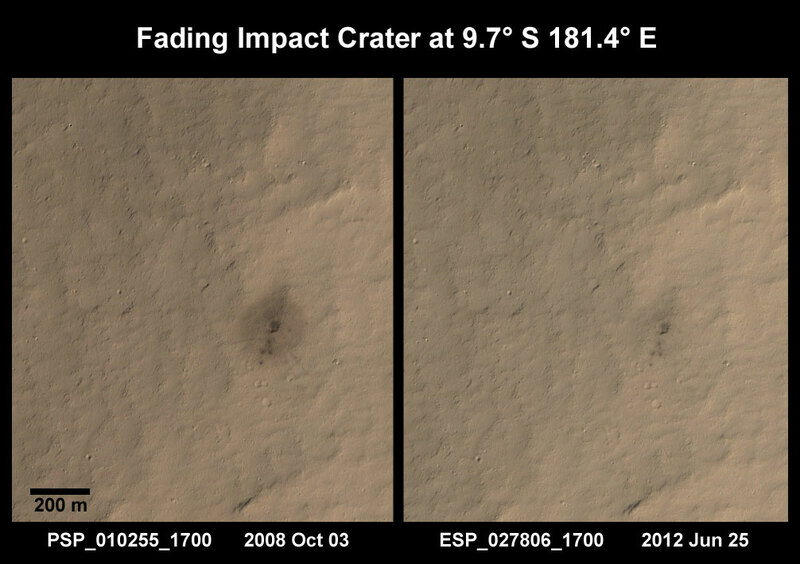 This likely happened because the object was a loosely held aggregate of material that broke apart when put under pressure by the Martian atmosphere. 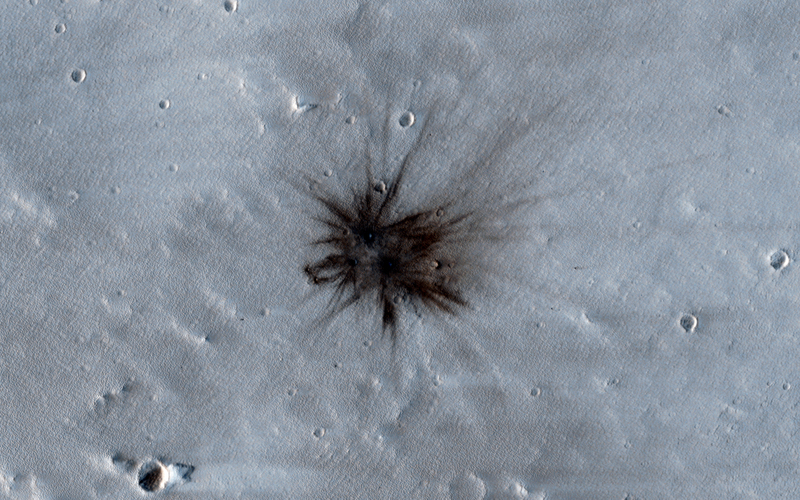 Each of the craters has a dark distinctive ejecta pattern surrounding it. 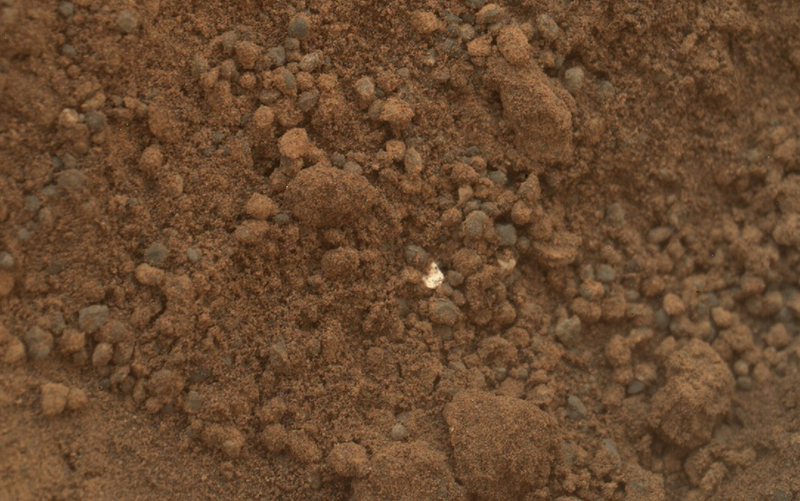 Today's image of Mars is of the first rock examined in earnest by Mars Science Laboratory, Jake Matijevik. 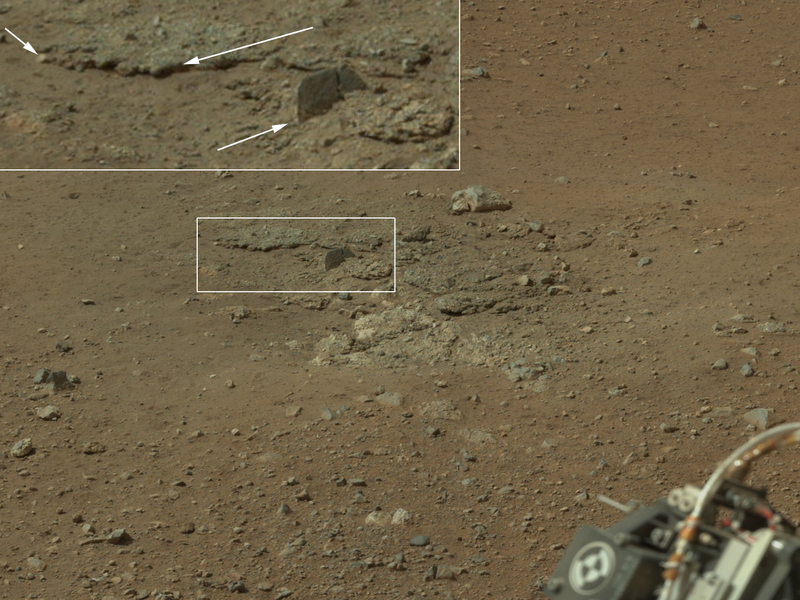 The odd, 25cm tall pyramid shaped rock is named after the late surface operations systems chief engineer, who passed away on 20 Aug 2012. 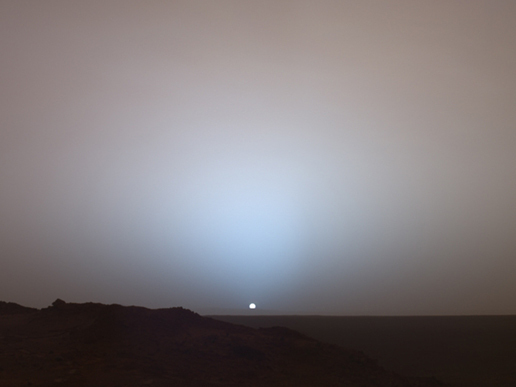 He had worked on all three other rovers, Sojourner, Spirit, and Opportunity. 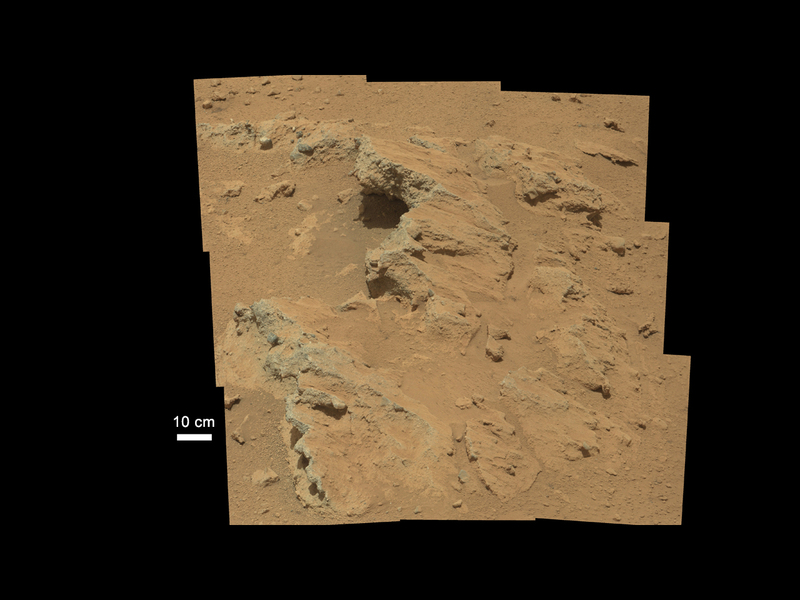 The rock Jake was used to test and calibrate some of Mars Science Laboratory's many tools, including the laser attached to the rover's ChemCam instrument, which determines the rocks chemical composition by analyzing the vaporized particles. 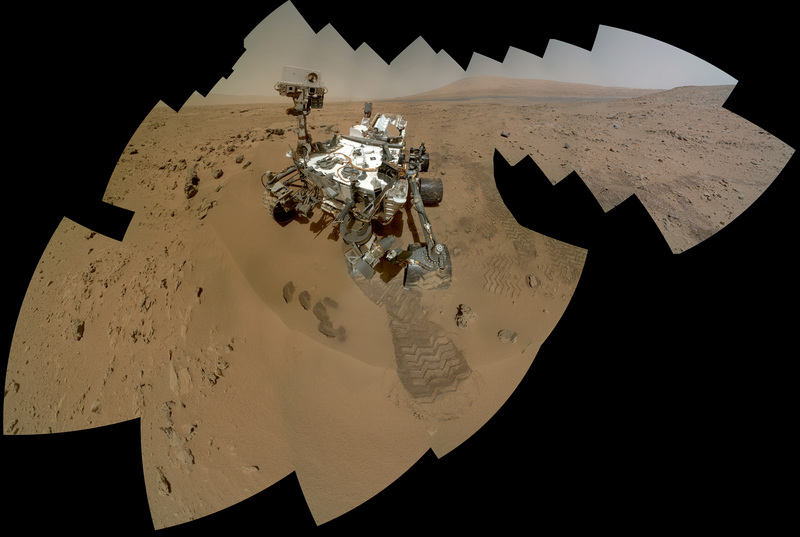 On 24 Sep 2012 MSL Curiosity finished up it's examination of Jake and began its longest drive thus far on the Mars, 42 meters. 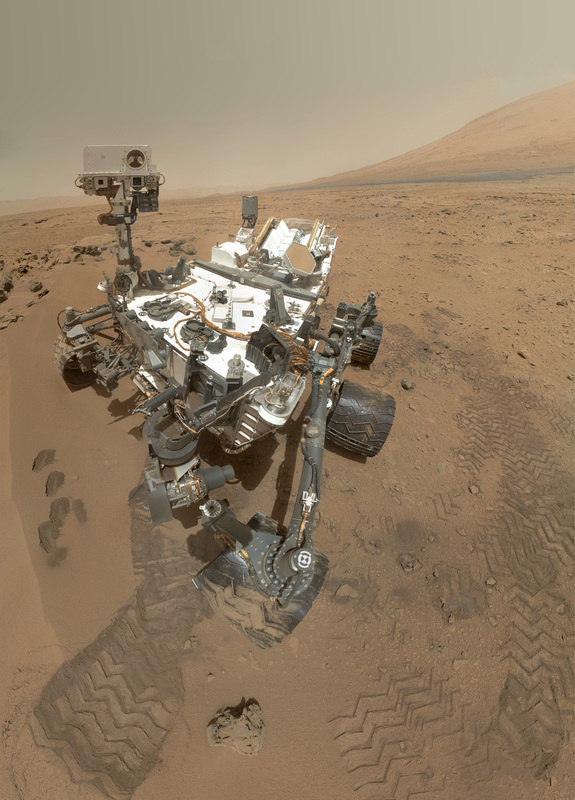 Over the next few days and weeks, scientists hope to test the rest of Curiosity's instruments, including it's scooping system and drill, which scientists hope will give them unprecedented insight into the composition of surface materials on Mars, as well as material that may lie right below the surface. Fill a bowl halfway with water and freeze it. After it's frozen, place a layer of sugar (powdered or granular) over the surface. Take a photo from above. You will notice that the marble made more of an impact in the sugar, but faced increased resistance when it hit the ice. This is a simplified version of what happened when the meteorite created this impact. The layer under the surface was denser so the meteorite faced much more resistance and excavated the material at a much lower rate, as seen below. Radar images taken by SHARAD, the radar instrument aboard the Mars Reconnaissance Orbiter indicate the presence of ice below the surface, which makes this area a potential site for future exploration of Mars. 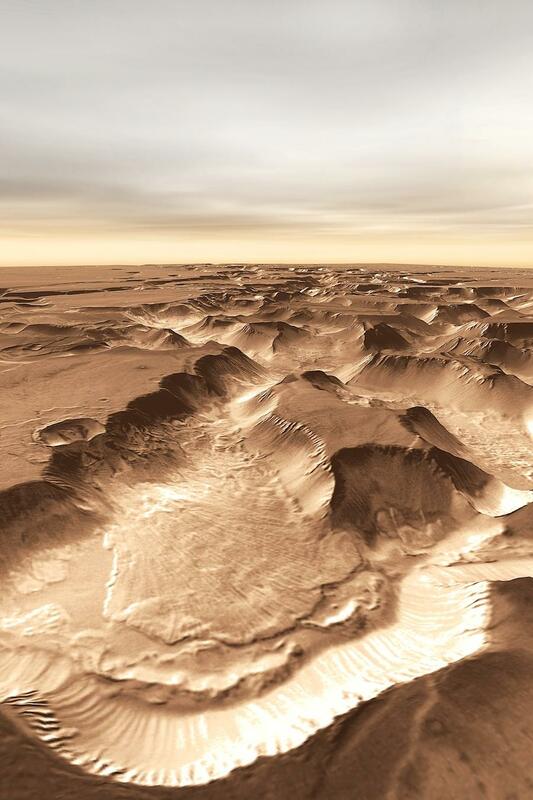 If we can access ice beneath the surface of Mars then we could use it not only for sustenance, but as a source of fuel for future missions to Mars. 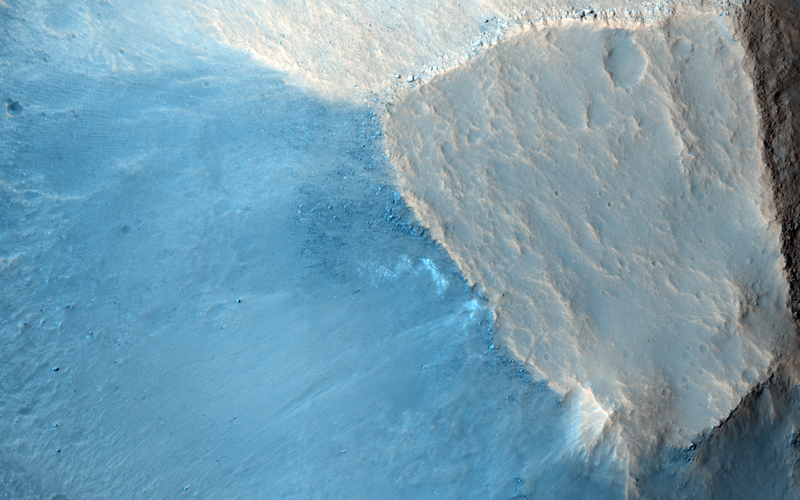 Today's Image of Mars shows Hadley Crater, just west of Al-Qahira Vallis. In this image from Mars Express you can see that the southern (left) side of the crater is much shallower than the north side. This is due mass wasting, an erosion process by which material slides down a slope under the force of gravity. Mass wasting can be started by the presence of water, an earthquake, erosion at the slope base, or ice splitting rocks on the surface. 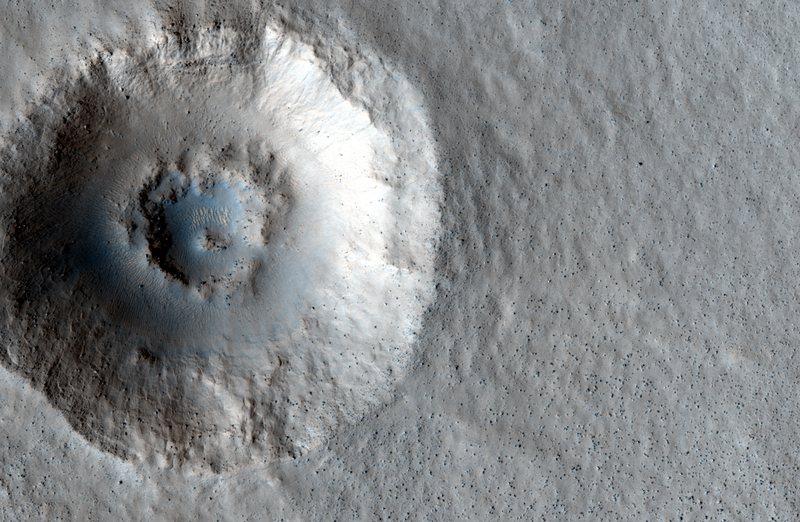 In this instance we cannot be certain what caused the mass wasting evident in this crater, or the period of time over which the process occurred, but by examining the smaller impact craters within Hadley crater, we will get a better idea of the past conditions in the crater. Why is this the case? Generally the deeper the material the older it is. 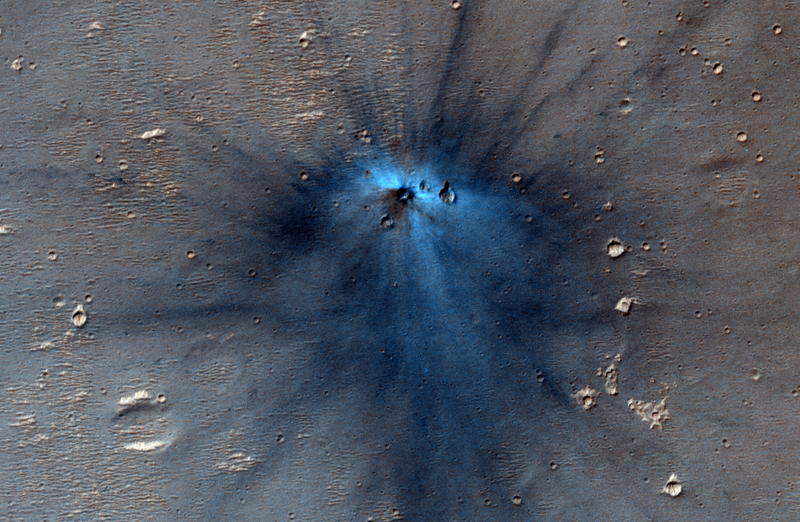 The impact that created Hadley Crater dredged up material from deep below the surface. 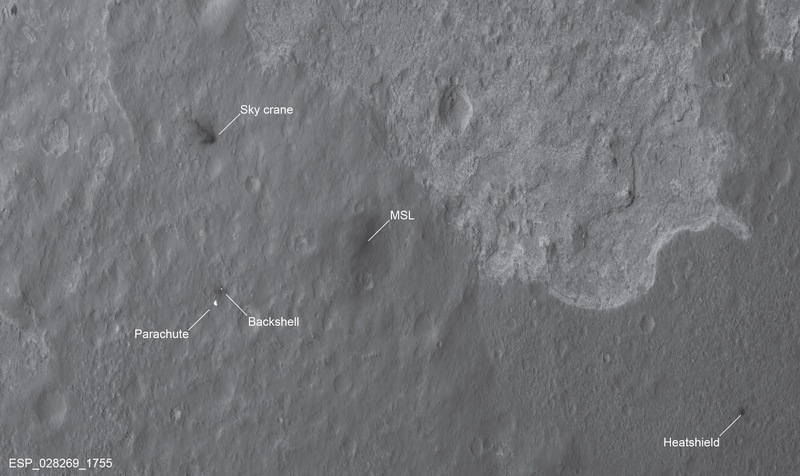 Following the impact of Hadley Crater, numerous other meteorites struck the same area, dredging up even deeper material. 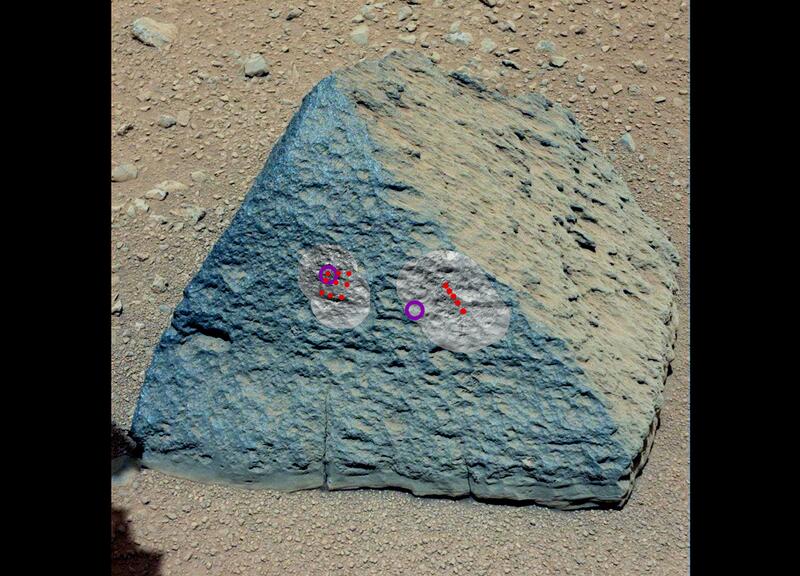 We can determine what conditions on Mars had to be present in order to create the ejected material. 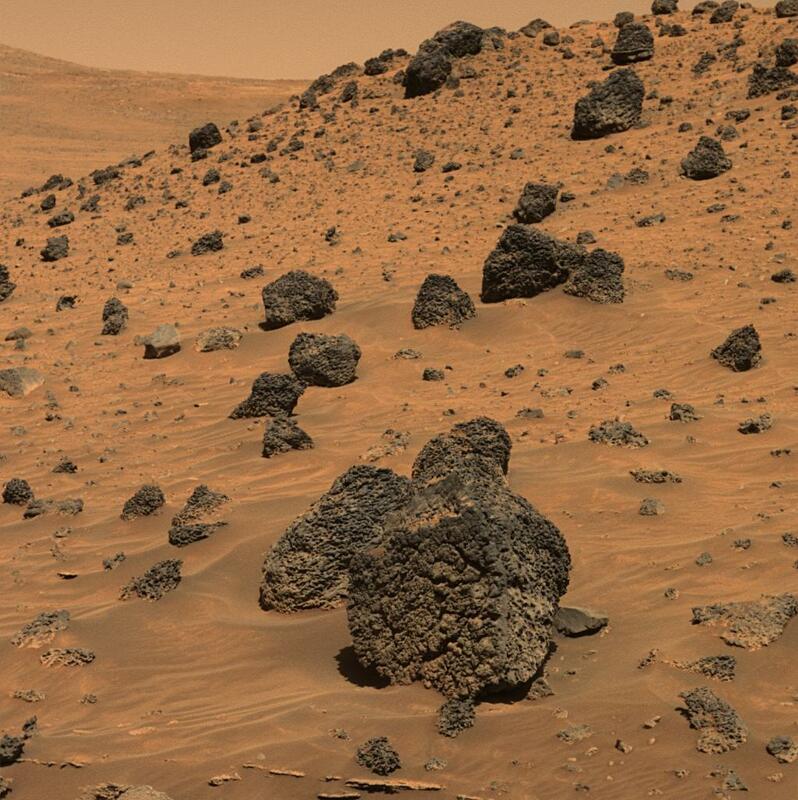 Scientists can determine how old the material is and combine that with their conclusions about the environment it was created in to determine when Mars had those conditions. 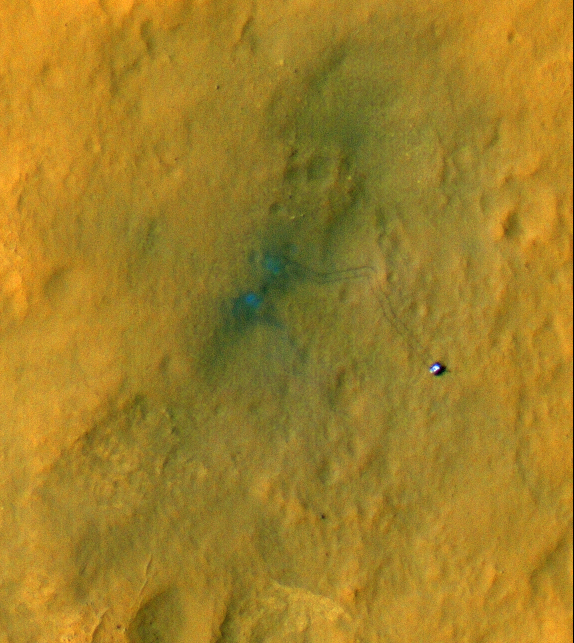 Take a look at this remarkable image from HiRISE showing Mars Science Laboratory Curiosity and the tracks it made during the first few drives in Gale Crater. 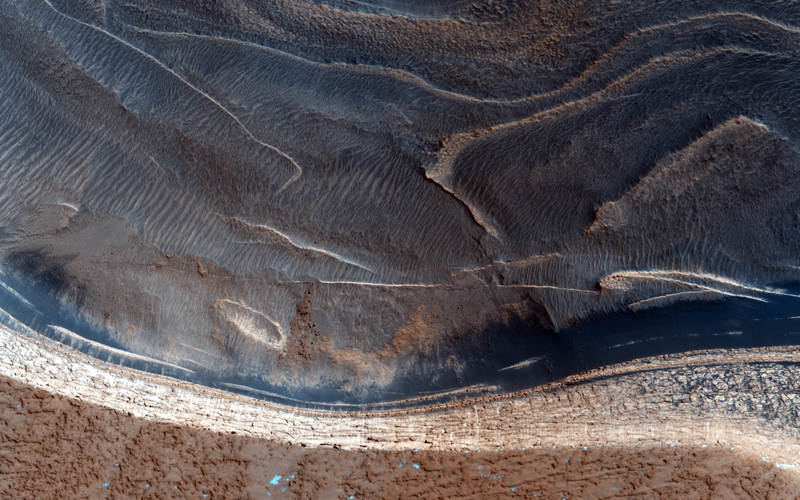 Scientists will be keeping a close eye on these tracks so as to track the rate of surface change on Mars. 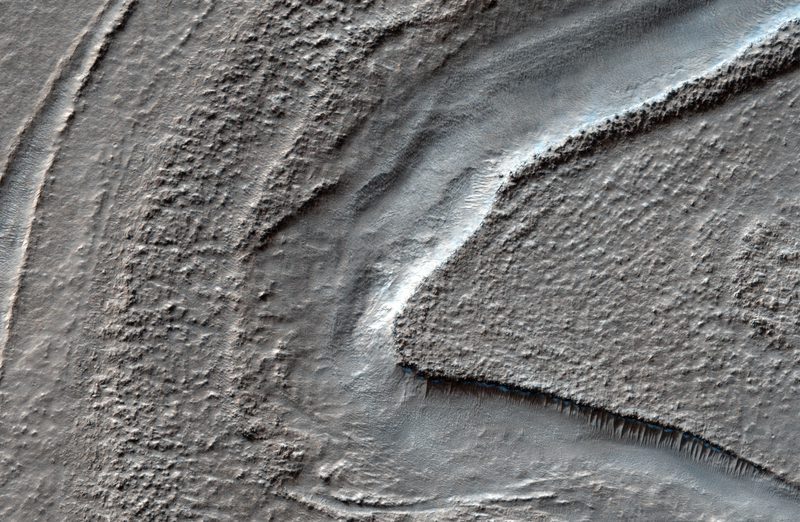 Click to see high resolution version from HiRISE. 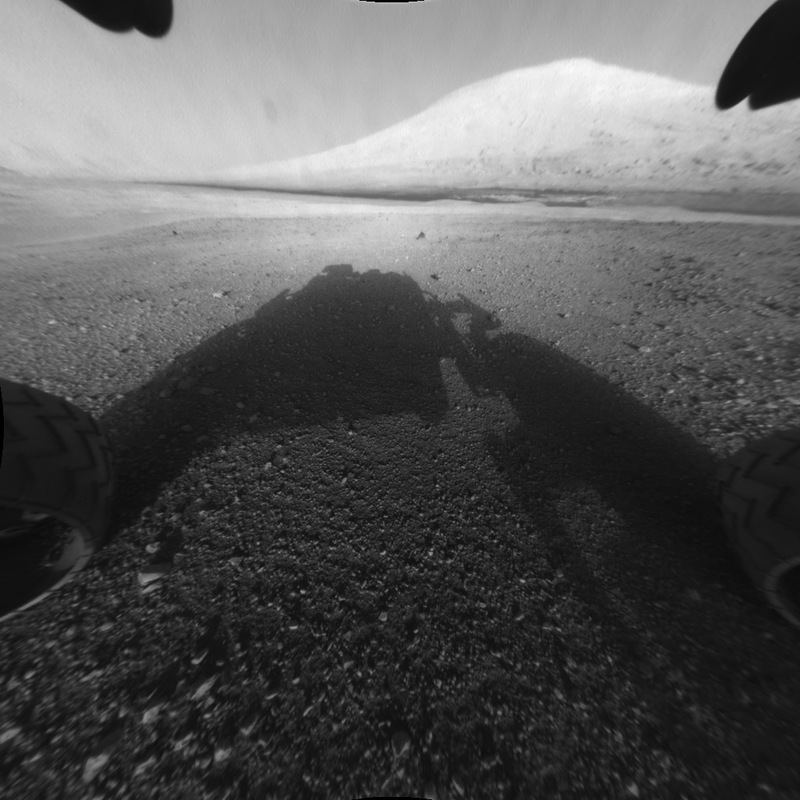 Imagine a Mars rover takes a long distance shot and sees something slightly protruding out of the surface. 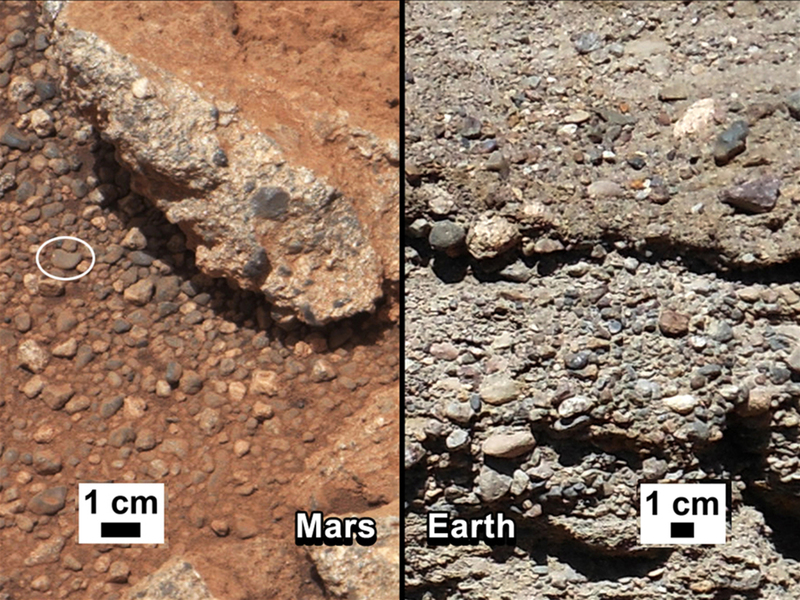 If we have a good idea of the rate of change on Mars then we can determine how long that feature will be there before getting covered up. If it will be covered up in a matter of days then it would become a higher priority then something that might be visible for a few weeks or months. If you send a manned mission to Mars it is essential that they are knowledgeable about the rate of surface change. 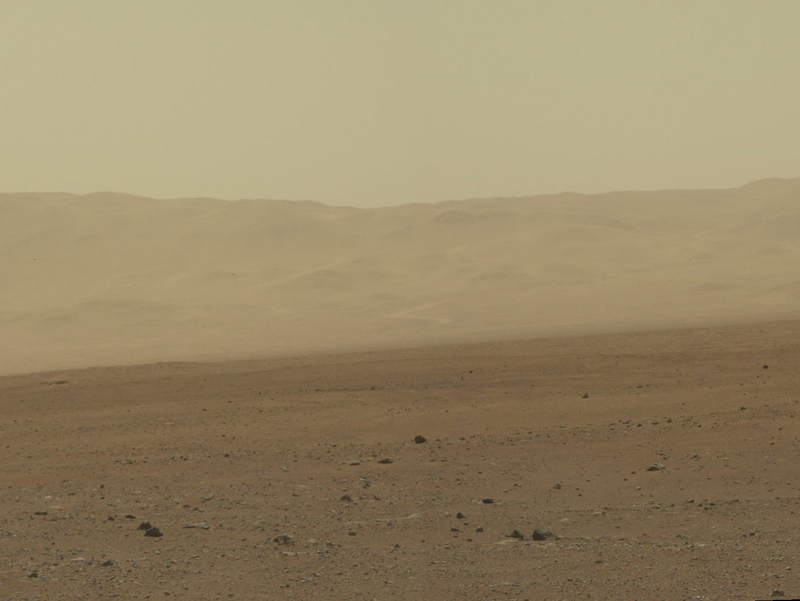 If you were going to take a walk on Mars you would make some reference points so as not to get lost. If you weren't aware of the rate of change you might use a field of hematite (blueberries) to the right of base camp as a reference point, not realizing that it might be covered up in a couple hours. You could get lost because you didn't know how fast something could get covered up! 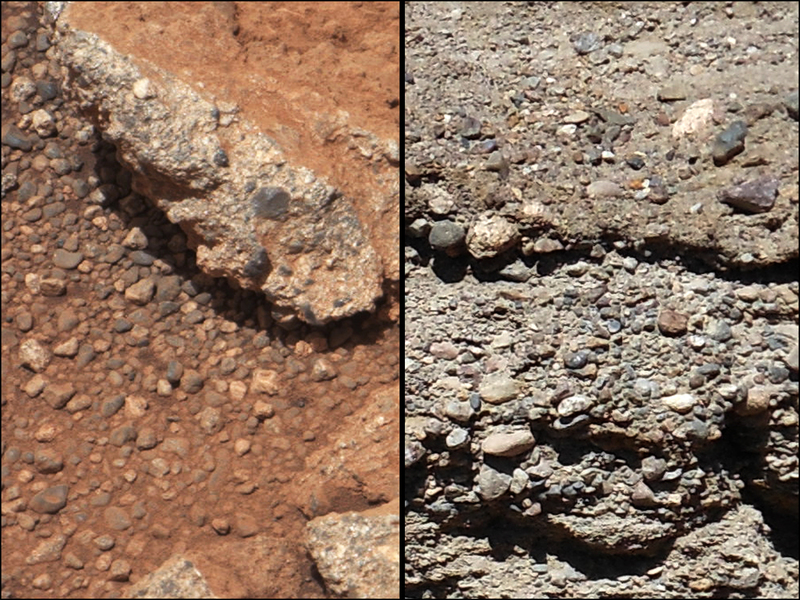 As you can see, images like the one above are essential to our understanding of Mars and could help us save the lives of future explorers and billions in hardware! 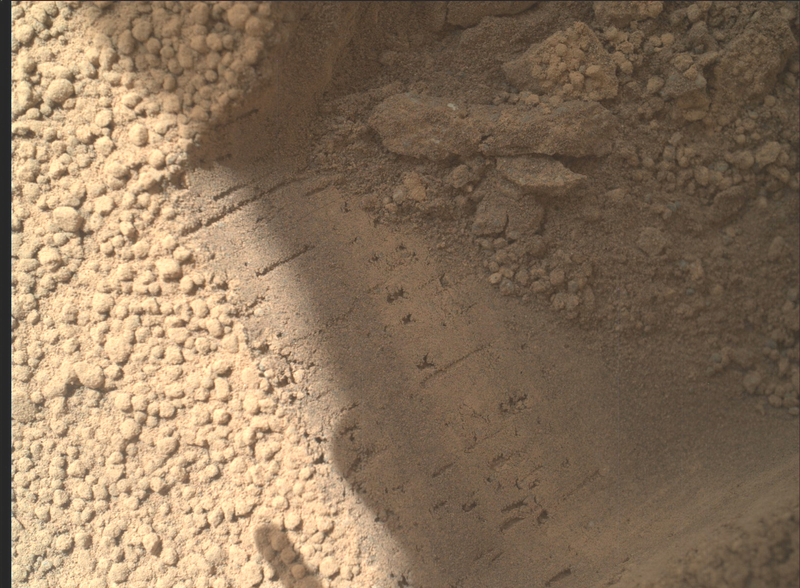 See Other Images of Tracks on Mars! 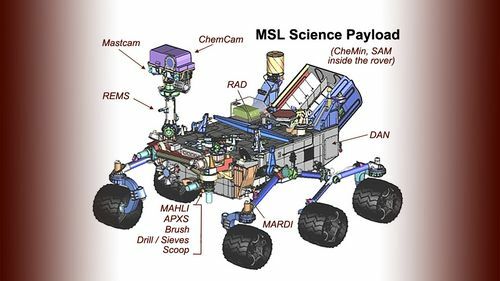 When Mars Science Laboratory (MSL) Curiosity performs its entry, descent and landing (EDL) sequence, it will be 7 minutes of terror. "EDL is referred to as the 7 minutes of terror because we've got literally 7 minutes to get from the top of the atmosphere to the surface of Mars. Going from 13000 miles per hour to 0, in perfect sequence, perfect choreography, perfect timing... If any one things doesn't work just right it's game over" - Tim Revellini, EDL Engineer for MSL Curiosity. 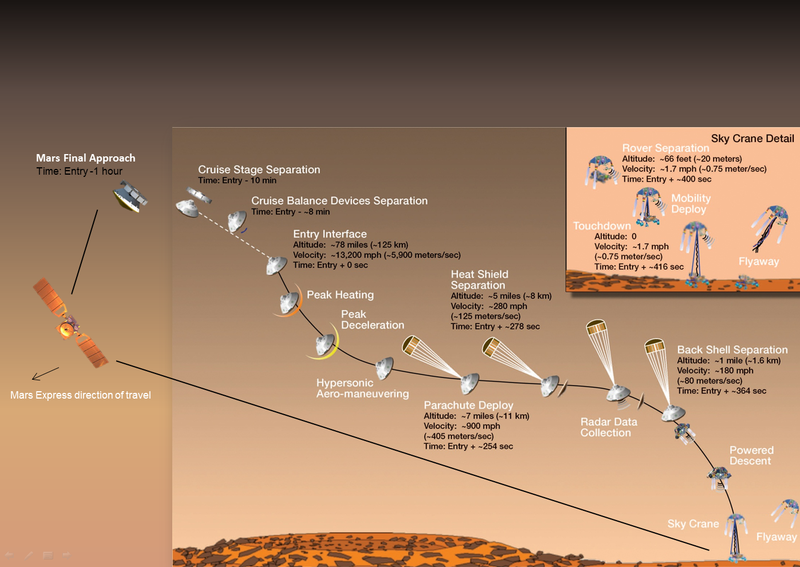 Below is the NASA/JPL video about landing Curiosity on Mars. 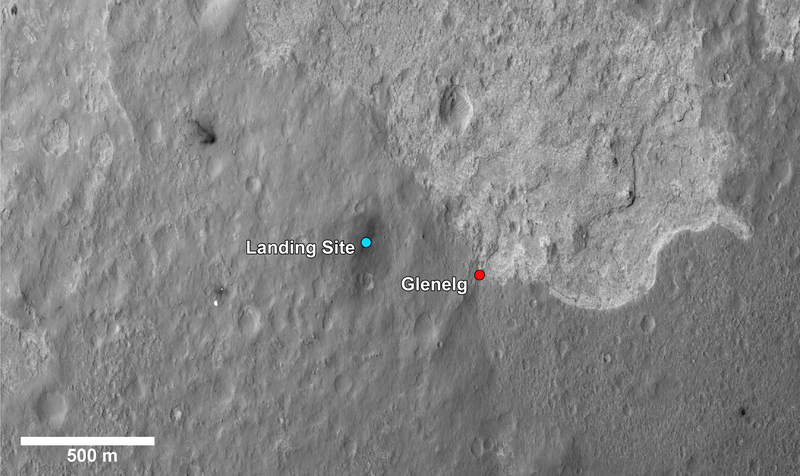 Touchdown is anticipated at 0131 ET on 6 Aug 2012! 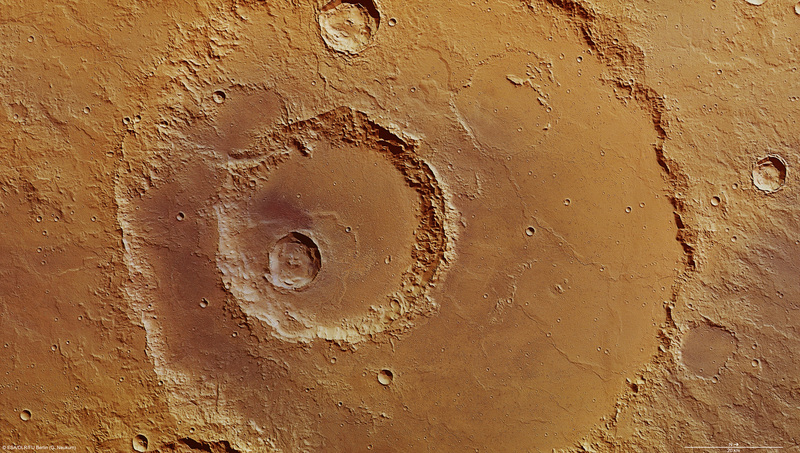 Today's Image of Mars shows what happened in Deuteronilus Mensae when ice quickly disappeared from the surface. The image below is of glaciers that once contained an abundance of ice, but when the climate changed, much of the ice on and near the surface disappeared into the atmosphere. 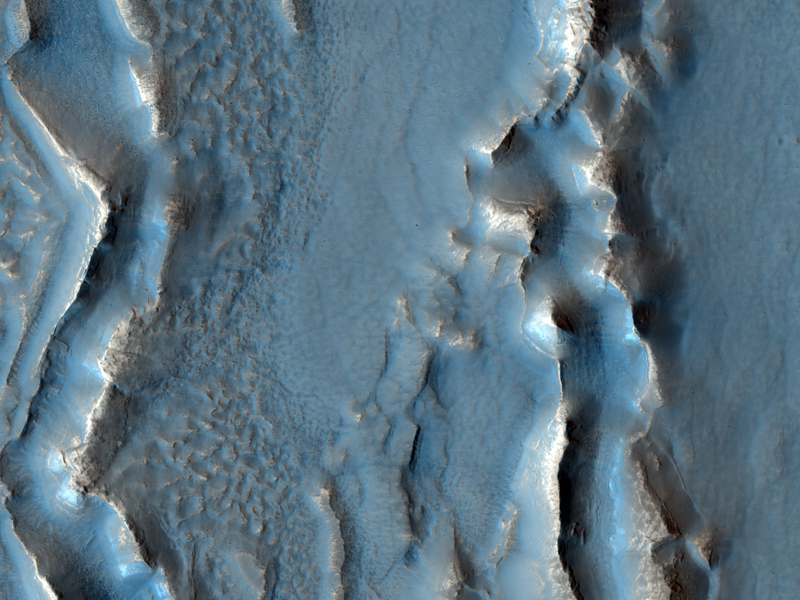 When the ice sublimated into the atmosphere it caused overlying terrain to collapse in on itself, creating the sharp, irregular features you see below. If we can determine when the features changed then that could tell us exactly when the climate on Mars went through a transition. If we know when the transition occurred we can make better guesses as to the reason behind the climate change. Perhaps an enormous asteroid collided with the planet, or maybe the rotational axis changed; there are unlimited possibilities, but knowing the time frame can help us narrow them down. 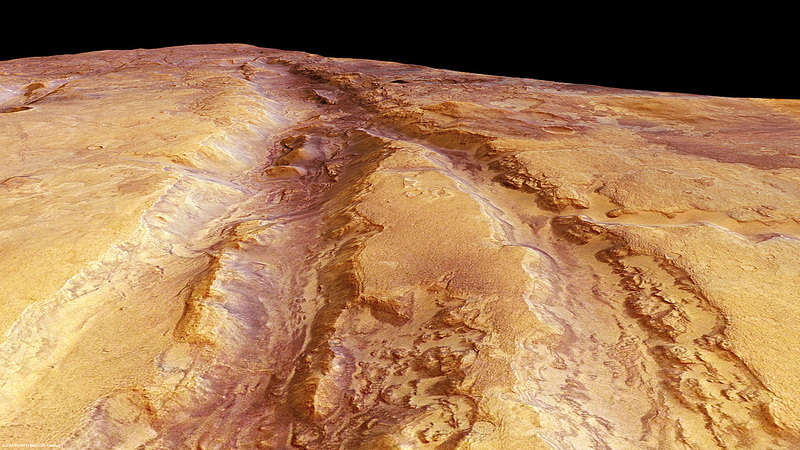 Clicking on this image will take you to the original high resolution HiRISE image. 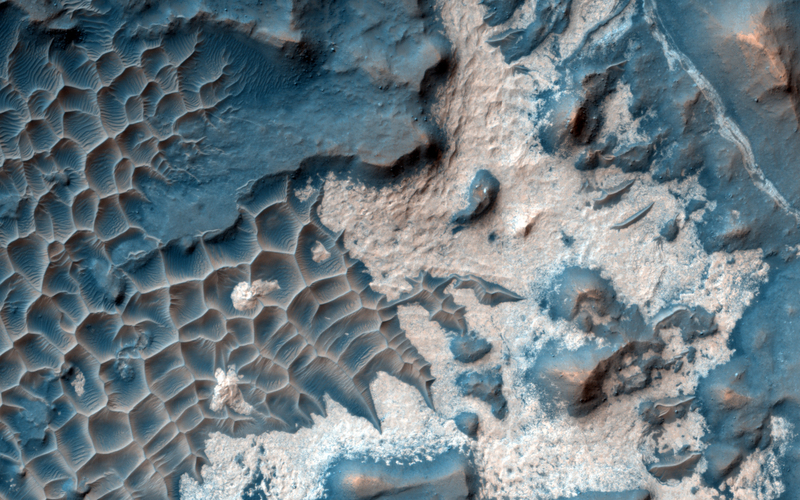 Today's Image of Mars shows bright material on the floor of a trough in Noctis Labyrinthus, which lies on the far western edge of Hellas Basin, just east of the Tharsis Volcanoes. What is this bright material, and under what circumstances did it form? 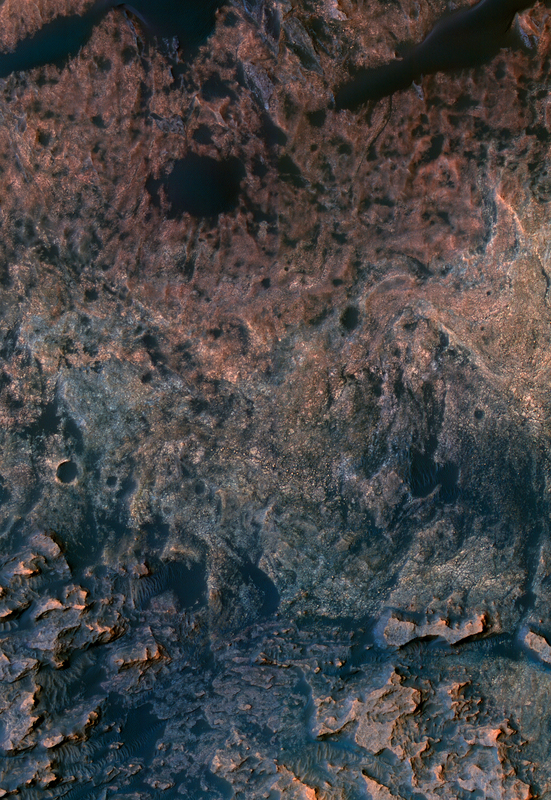 Examination of this bright material by Mars Reconnaissance Orbiter's CRISM shows that the bright material contains water. 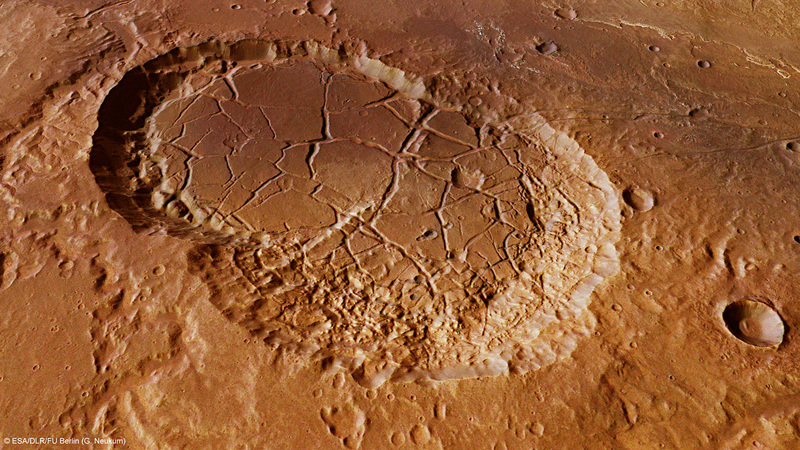 The hydrated material likely formed when ground water welled up into low lying depressions or when ice within Noctis Labyrithus was melted by volcanic activity in the nearby Tharsis region. 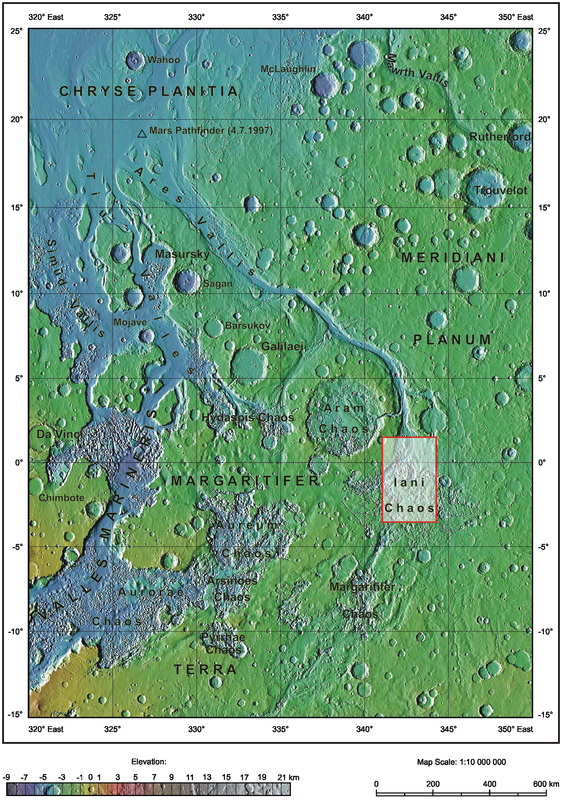 One day we may send a rover or even a manned mission to this area to find out exactly where the water came from, and more importantly, where it disappeared to. Until that time, further analysis from orbiting camera like those aboard the Mars Reconnaissance Orbiter will still provide valuable insight about the past and present climate on Mars. Maybe one day we will image something that will help us pinpoint the exact reason and time that water disappeared from the surface of Mars. For that answer, and many others, we will continue searching.